At the Horizon restaurant all of the savours of a gourmet Mediterranean cuisine are unleashed in a relaxed atmosphere that offers sublime views across the bay and over the legendary Casino. 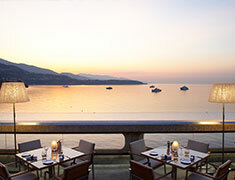 The hotspot to enjoy the prestigious atmosphere of the Monaco Grand Prix. Open for breakfast, lunch, dinner and late night bites as well as to enjoy the music spun by Nikki Beach’s world renowned Resident DJs. The Saphir 24 dominates the gallery of the hotel offering, with its fabulous bay windows, a panoramic view over the Riviera. Comfortable, relaxing, and open 24h/7d, it features the best of a “bistrot chic” cuisine and represents the ideal stopover at any moment of the day. At Nobu indulge in a gourmet journey anddiscover his amazing cuisine, mixing traditional Japanese dishes and South American ingredients using subtle spices and aroma combinations.